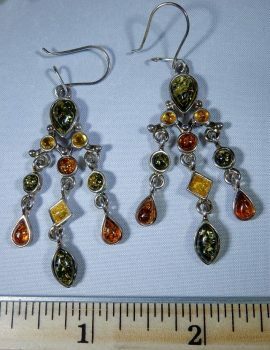 These amber chandelier earrings with green, honey, and golden amber in sterling silver are quite the work of art. 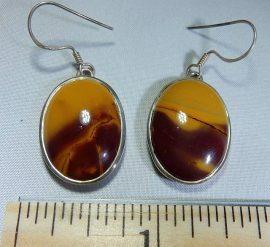 Treat yourself to the warm energy of these great amber cabochon gems. 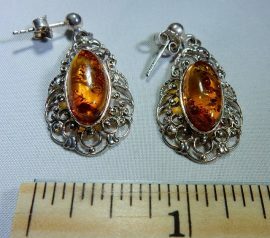 These amber filigree oval earrings in sterling silver are very detailed and bright. 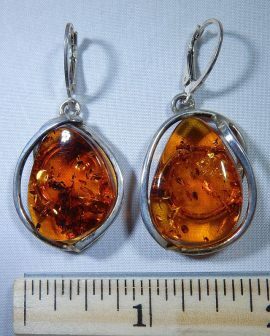 The clear honey amber gems are sure to bring sunshine into your life. 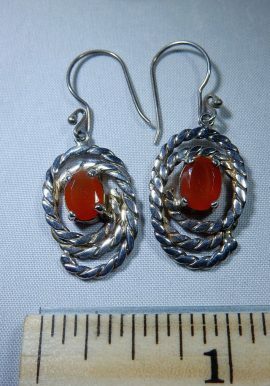 These carnelian oval earrings in sterling silver have a unique layered rope design. 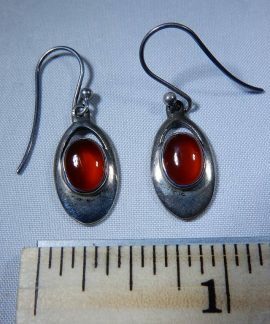 You will enjoy the vibrancy of the faceted orange carnelian so rich and enlivening. 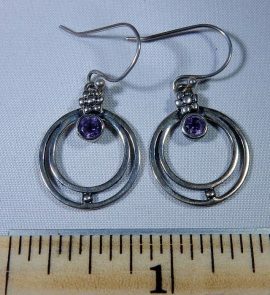 These iolite round earrings in sterling silver are great for calming a busy mind. 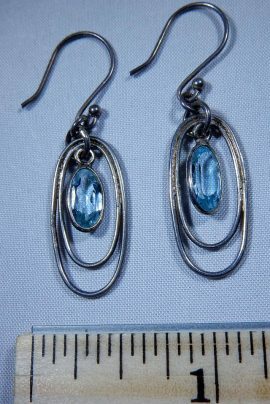 The petite double circles around the faceted iolite really give these a classy and elegant look and feel. 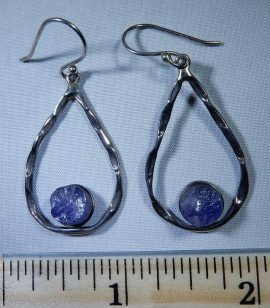 These iolite, raw stone, earrings in sterling silver are one of a kind. The raw texture and deep dreamy hues are perfect for calming the mind. 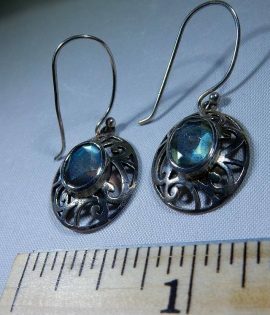 These faceted labradorite oval earrings in sterling silver are elegantly designed with filigree work. 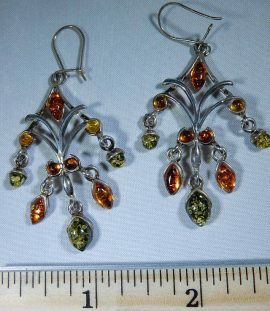 You can see the fire in these magically beautiful gems. 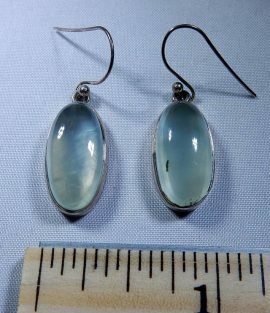 These larimar oval earrings in sterling silver are perfect for the mermaid in your life. 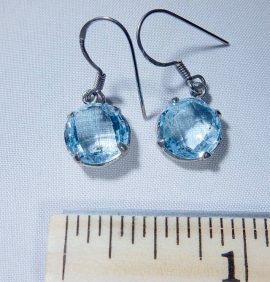 Celebrate the light blue hues of the ocean in a gem with these earrings. How can this crystal help you in your life? See the description below for a list of the physical, emotional, and spiritual properties of larimar. 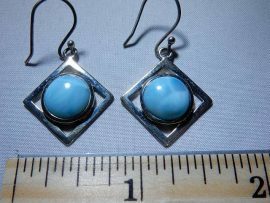 These larimar round cabochon earrings in sterling silver are inside the square design of the silversmithing. 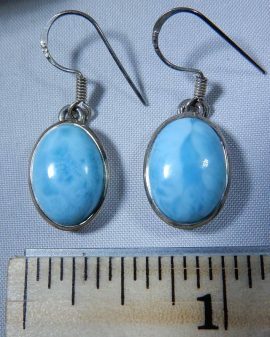 You can see the calming color fusion of the white and blue larimar open up the energies of the ocean. The mermaid within can feel at home with the help of this gem. 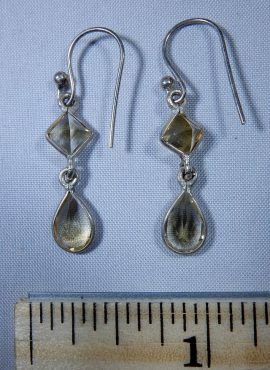 These mookite jasper oval cabochon earrings in sterling silver have a great energy for your mediations and staying grounding. 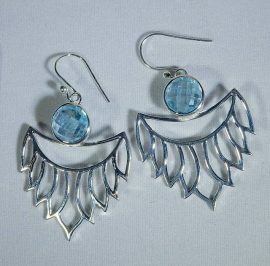 These bezel set beauties will let the inner shaman in you speak out and transform your life. 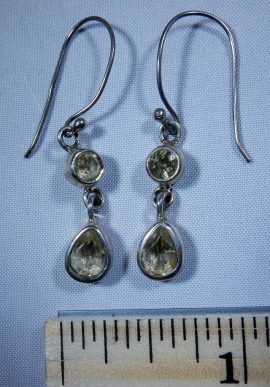 These prehnite oval earrings in sterling silver are elegantly bezel set. The prehnite oval cabochons have a lovely hue of green and dreamy look about them. 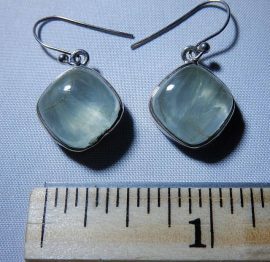 This prehnite square cabochon earrings in sterling silver are a simple and beautiful pair to wear everyday. Let these gems open your heart. 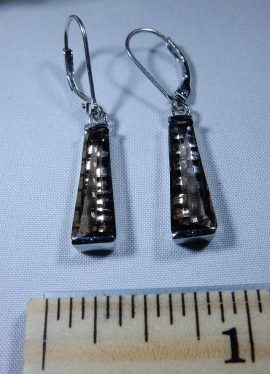 These faceted smoky topaz earrings are a special long tapered rectangle cut. 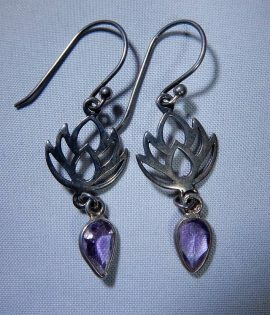 The soft relaxing energy of this gem will complement you on your journey.